Crohn's Disease Awareness Day - Help Us on Twitter | Im CrohnsFighter and this is My Fight against Crohn's Disease. Today is the day! March 14th is here, and your help is needed. Help is needed to make #crohns a trending topic on twitter. By making it a trending topic, we can let everyone know about this crappy disease. To help out, all you need to do is tweet! 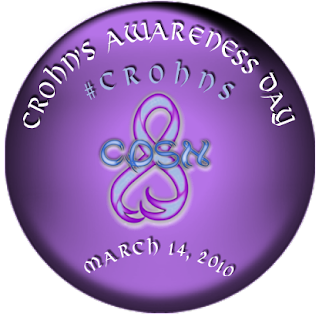 When you send anything on twitter today just add #crohns to your message. To get you started click one of the messages below to send it out.